These acclaimed and well attended night runs have become legendry with adventure runners and joggers alike. The 6km family fun run draws around 350 dedicated runners and joggers. The more adventuresome runners opt for the 10km cliff path run. A true night run, only you, your headlight, your heartbeat and the sea in your ears. Park your vehicle at Grotto Beach and make use of our FREE shuttles to the start lines. Check out the beautiful unique whale tail medal! The FREE shuttle will leave Grotto Beach at 17:30 for The Marine Hotel. Registration at The Marine Hotel will open at 17:00. Starting at 18:30 at The Marine Hotel. From the Hermanus New Harbour to Dutchies Restaurant at Grotto Beach – Hermanus. Registration at New Harbour will open at 17:30. 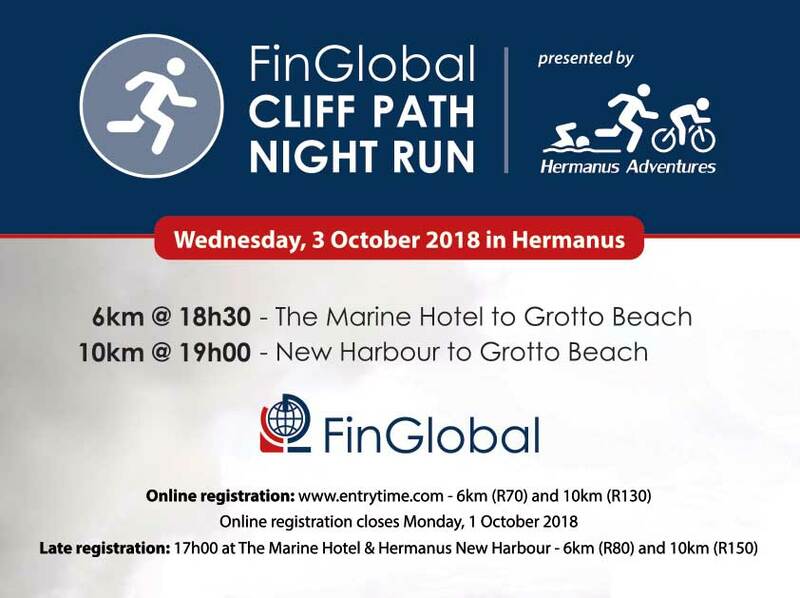 10km run starts at 19:00 at the Hermanus New Harbour. This is a night run; a torch or headlamp is compulsory. Phone torch not sufficient! Great cash prizes for men and lady winners. Hydrate well, there will be no water station on the trail. Full bar and food facilities will be available at Dutchies Restaurant. Listen to the waves, feel your heart beating and enjoy the bliss of running in the dark, it is absolute fantastic!